Everyone knows that one person. You may not think you have this “one person” in your life, but we’ll bet if you think hard enough about it, you’ll realise who it is. Who is this “one person” we’re talking about? We’re talking about the person whose house is immaculate but whose garden is a mess. You know the one. Inside the home, everything has its place. Horizontal spaces are clutter free, cutlery and crockery are lined up perfectly, and there is a (artificial, of course) candle flickering on the dining room table. The beds are always made and, no matter how many surprise visits you make, you will never find a pile of wet towels and dirty laundry on the floor in front of the washing machine. But the outside – well, that’s another matter. This person spends all of their cleaning and decluttering energy indoors, and completely neglects their outdoor area. The moral of our story is that we want to help you to avoid being that person, and as much as we love giving you dozens of ideas for interior design, we don’t want to neglect your outdoor area anymore than you want to. 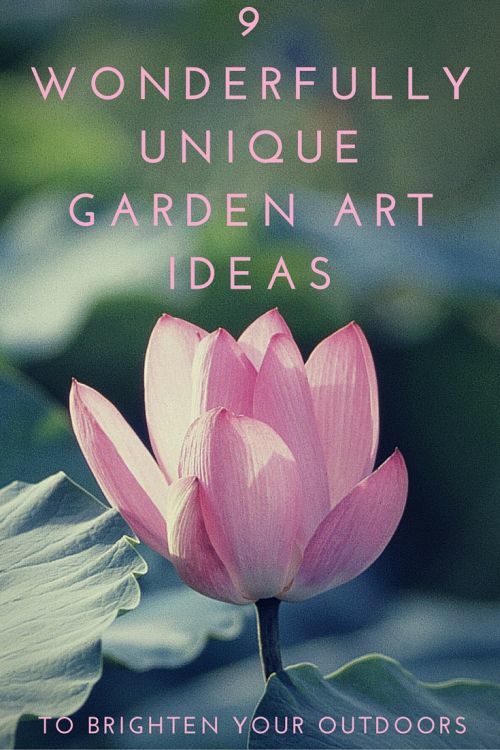 And on that note, here are our top picks for fantastic garden art ideas to make the outside of your home as beautiful and as well put together as the inside. First of all, let’s start with fences. For most people, the outside area of your home will be relatively small, and unless you enjoy sharing space with your neighbours, you’re going to have some kind of fence area to separate your space from the world at large. This means that when people enter your backyard area, they’re going to be faced with a fairly large surface area of fence. While there are some stunning ideas for fence art, this one really caught our eye cause of how colourful and artistic it looks, without requiring a huge amount of initial outlay. The best way to personalise any decor is with custom photography, though this is usually reserved for indoor areas which are not subjected to the elements. But with brushed aluminium prints, the world of custom wall art (or should we say fence art?) is opened up to you, as aluminium prints are strong, durable, and completely weatherproof. What will you choose for your custom brushed aluminium print to liven up your outdoor area? You could start with a family photo, or perhaps a photo of your pets or other inhabitants of the outside area of your home. You could even go with something generic that inspires you: your favourite flowers in full bloom, or an idyllic koi pond or rainforest scene. When you’ve made your selection, click here to create a custom aluminium print in a range of sizes and configurations. 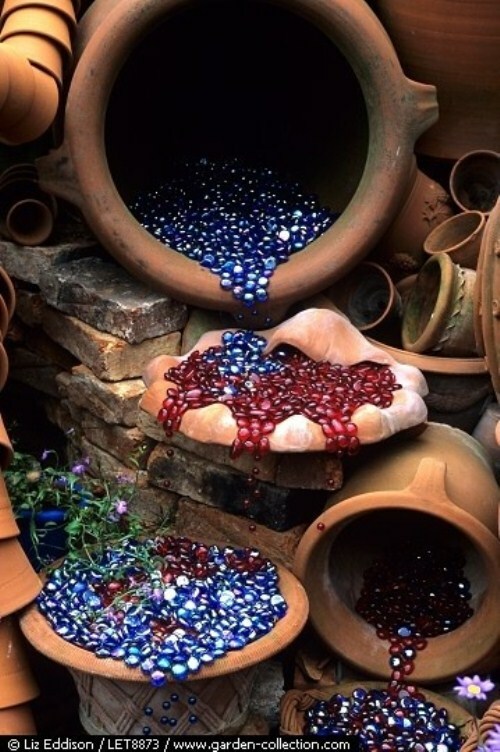 For a more earthy feel, consider working with garden art ideas that involve natural materials, such as pebbles, earthy rocks, and shells. 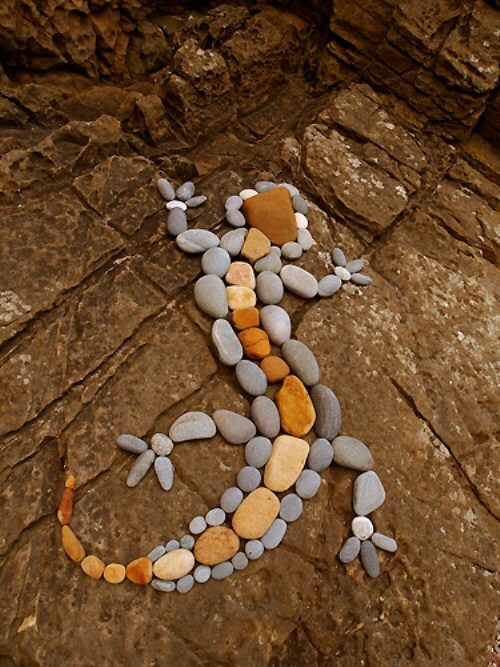 You will only be limited by your imagination as you create outdoor art using natural materials. If you have pets or small children who won’t be able to resist the temptation to move your creation around, consider affixing your final product to the ground (or vertically to the fence) using weatherproof adhesive. 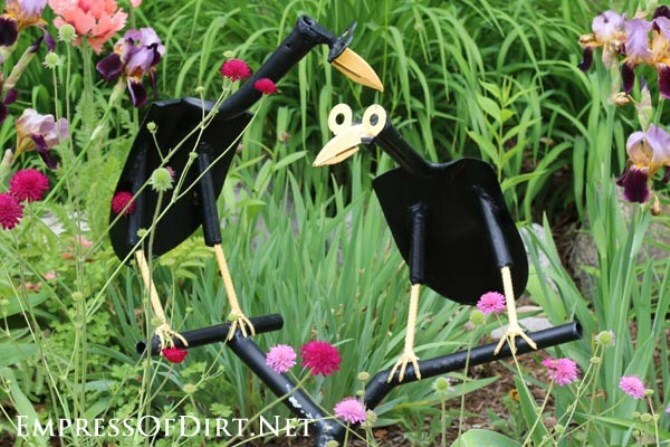 For something a little different, we couldn’t resist adding this DIY tutorial for making comical looking crows out of shovel heads. The same tutorial set also includes instructions on how to make a woodpecker from a circular saw blade, a bird from an old hammer head and a surprised looking bird from a golf club. 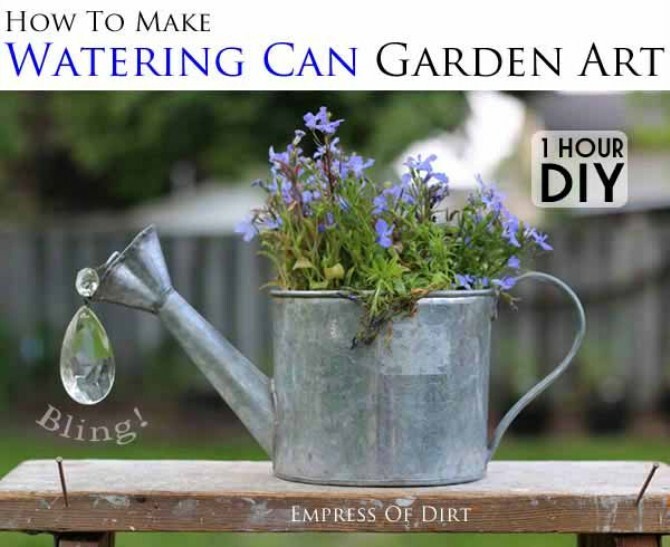 Watering cans – especially those old-fashioned metal ones – are iconic images associated with gardening, and there seems to be a trend of turning old-fashioned watering cans into useful garden planters by using glass ornaments to symbolise drops of water. If you’d love to have a water feature in your backyard but can’t due to housing regulations or for safety reasons due to your pets or young children, you can still elude to water in your outdoor area, and this would have to be one of the most effective faux water features we’ve seen. We love this garden art idea as it work beautifully both indoors and out. 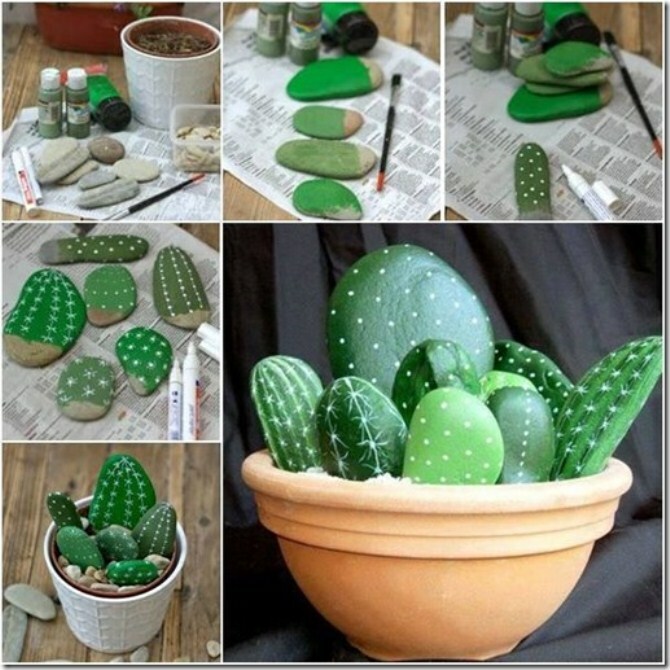 Perhaps you don’t have much of a backyard, or you live on an upper level floor with a balcony instead of a courtyard: create your own cactus garden by cleverly painting smooth pebbles with various cactus designs. A cactus garden would also make a fantastic gift idea, and one that family might enjoy making together. Seriously, how cute are these? 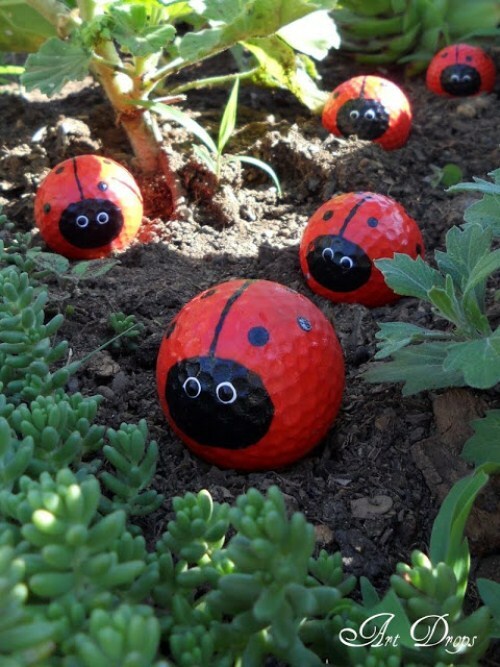 The DIY instruction are not in English, but it would be worth translating the instructions using Google Translate to learn how to create these bright and colourful critters to decorate your backyard garden. We found this tutorial on Facebook and couldn’t resist. 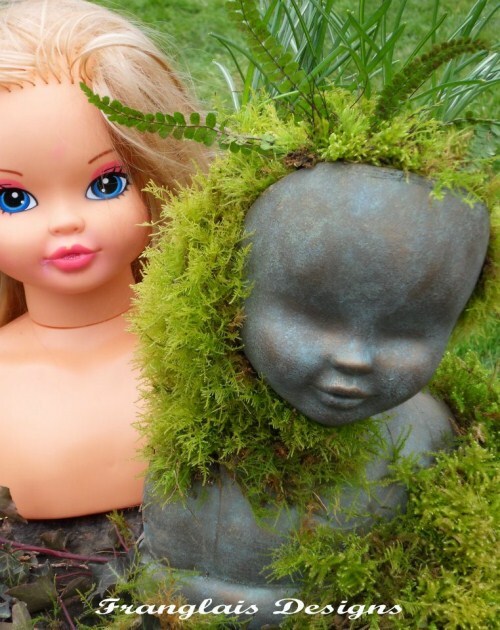 Someone very clever thought to use an unwanted doll to create a concrete garden mannequin. It seems that they started by cutting the back of the plastic doll’s head to use the face as a mould, pouring concrete inside and allowing it to set. The end result is strangely detailed, and surprisingly not creepy considering that it has no eyes. The seasons are changing, and it’s the perfect time to head outdoors and create some garden art to beatify the outdoor areas of your home. We’ve got one more bonus garden art tip for you: after you’ve spent time creating your masterpiece, wait for one of those magically perfect moments when there’s just the right amount of sunshine, and take a photo of your latest creation perfectly situated in your garden. Upload your photo to our online tool and we’ll turn it into a professional quality, custom canvas print for you. Now you can display your custom canvas print indoors and enjoy the perfection of your outdoor area even on those bad weather days.